ANHA, QAMISHLO ─ Internationalist combatants fighting in the ranks of YPG/YPJ (People’s/Women’s Defense Units) have released a statement saluting the self-rule resistance in Bakur (North) Kurdistan. Revolutionaries called upon the youths to join the resistance alongside the YPS (Civil Defense Units) and guerrilla forces. The situation right now is very critical. The war in Northern Kurdistan, the part occupied by Turkey, has been raging for half a year. 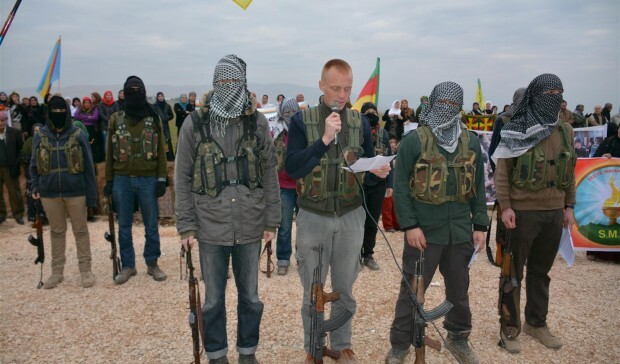 The attack on the guerrilla-controlled territories by theTurkish occupation forces on 24th of July was answered by the people by declarations of Democratic Autonomy in many areas in Northern Kurdistan. They built up communes and local councils, just like in Rojava. Led by the YDGH and YDGK youth and young women’s movement the people organized their self-defense and erected barricades in their neighborhoods. The Turkish state saw this as a threat to its authority that had for the last years merely existed symbolically in the Kurdish regions and attacked with uninhibited brutality.